Truth be told, it had been a couple of years since we had been in, and we were saddened to hear of the passing of Odilia Arce Benitez — the founder, owner and chef of our best neighborhood Mexican restaurant. Since her death in 2010, son David has taken over the reins and we’re happy to report the food is as good as ever — nothing frozen or from a can — and the salsas and spices as mas caliente as they are south of the border. Our camarones e pulpo diablo (pictured above) was as fiery as this gringo can take it, and everything from the fresh, lime and cilantro-studded salsa to the frijoles has an earthiness, and a sizzle and snap that you just don’t get in most Mexican eateries. The place is perennially packed with Mexican-Americans and their families, and walk in the door and you’ll probably be the only gringo in the joint. That’s the way it should be and that’s the way Odilia wanted it: authentic chow for her countrymen to remind them of their homeland. Not a bunch of watered down mush for people who wouldn’t know a huarache if it bit them on their flauta. 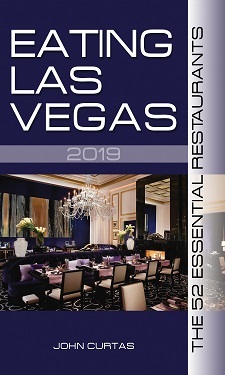 Los Molcajetes only received a mention in the first two editions of EATING LAS VEGAS – The 50 Essential Restaurants, but if it’s up to this muchacho, it’ll crack the top 50 in the next edition. A well-deserved repeat shout-out. Just remarkable the quality of ingredients and integrity of product they serve in such an out of the way location. Someone could put their combination molcajete on the menu at a high end Strip location at about $40 and not bat an eyelash.